Earlier this week I noticed our first layer, a white hen, with a tiny bloody gash on her comb. Knowing that chickens tend to pick on the injured I promptly cleaned her off and applied some homemade Balm of Gilead to the sore. That night, EVERYONE received a little bit of balm rubbed into their combs so no one chicken was singled out and they’d all get their turn being handled. Since I ‘pet’ them each night before I lock up they are used to being touched, even my most skittish hen handled the comb touching well. Over the course of the week, things seemed to have returned to normal and her comb quickly healed. However, during a recent nightly inspection everything changed. Poor Whitey had one of her wattles flapping bloodily next to a pea sized, v-shaped, open wound in her neck. Once again I hauled this silly girl into the house and proceeded to clean her wound. There really wasn’t much I could do for her besides clean off any remaining debris and apply Neosporin. To give her the best chance at healing and to reduce the likelihood of infection she spend the night in a dog crate in our garage. She seemed to be feeling well the following morning as I cleaned her up once again and reapplied the antibiotic cream. 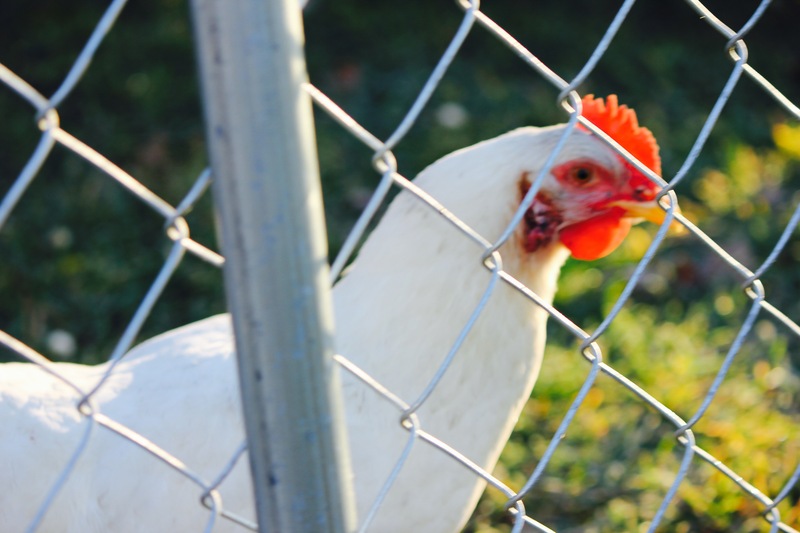 Since she hadn’t laid yet that morning she was allowed sole occupancy of the coop with nesting boxes for about 30 minutes. That was all it took, this girl was definately ready to lay her egg and get on with the rest of the day. Keeping her segregated from the rest of the flock while still allowing her access to grass and bugs took a little early morning muscle. I arranged our 4 panel dog kennel with food, water with oregano (a natural antibiotic) and some scratch to keep her busy. 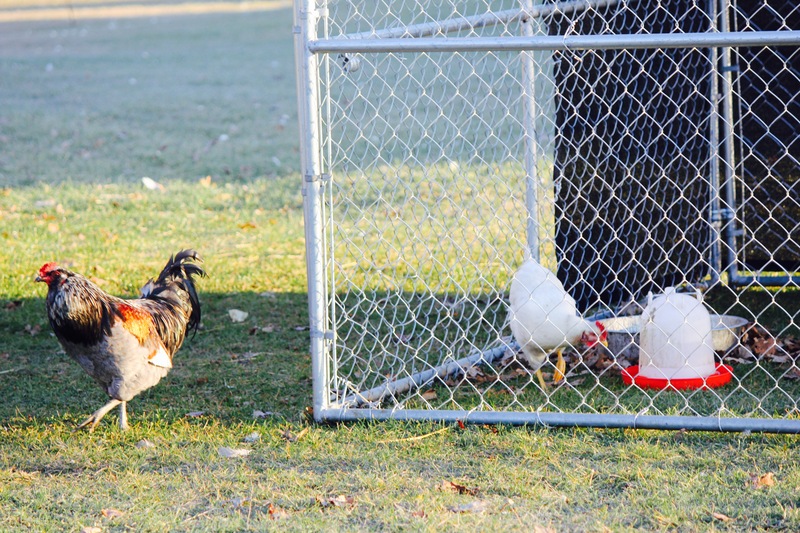 Benny (shown below) watched over her for a little while until the more dominant rooster came to inspect the situation. As I sit here watching her pace back and fourth I hope she realizes this is for her own good. Most likely, her wound was from an over zealous rooster (Spaz – he’s my dominant). Until she’s back in tip-top condition she will be under my supervision away from the other birds. For now, all I can do is watch for signs of infection and hope I don’t loose a bird so early in my chicken keeping experience. 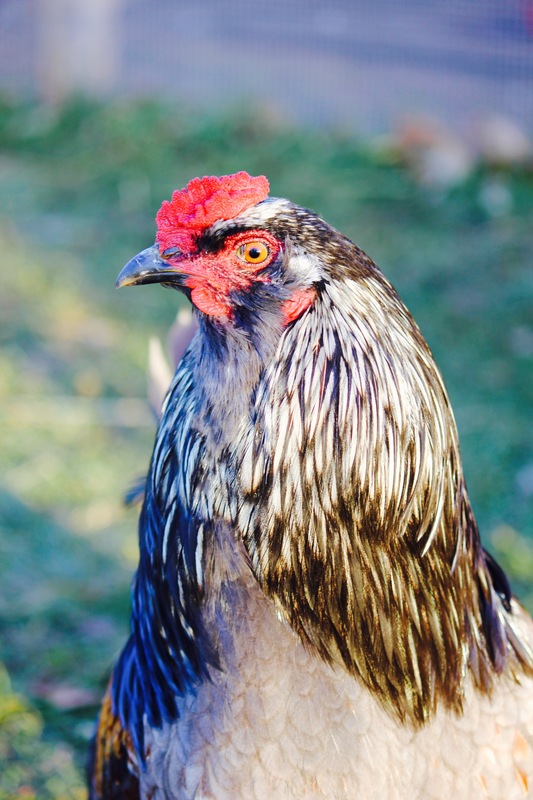 Here’s a little gratuitous photo of my favorite rooster…he’s such a ham. He’s a real gentle fellow who has always kept watch over Whitey. In fact, when she was laying her first egg he sat in the nesting box right next to hers, keeping watch until she was finished. FUN FACT: Benny’s name is actually Benedict…as in Eggs Benedict. It’s not the most original name but it suits him well.